I'm spending a few days in the Sussex countryside for the Easter holidays and enjoying going on lovely walks. I spotted this snake in a water meadow by a stile I was about to cross. I managed to get one photograph before it swiftly slithered off into the undergrowth. I guess I don't have Harry Potter's skills in snake communication because I think the poor thing was more frightened of me than I was of it. I was unsure if it was a harmless grass snake or a poisonous adder because I couldn't see the back of its head where the adder has a tell-tale V or X marking. After I got home I looked it up online on the BBC nature website and I am now pretty sure it was a grass snake. 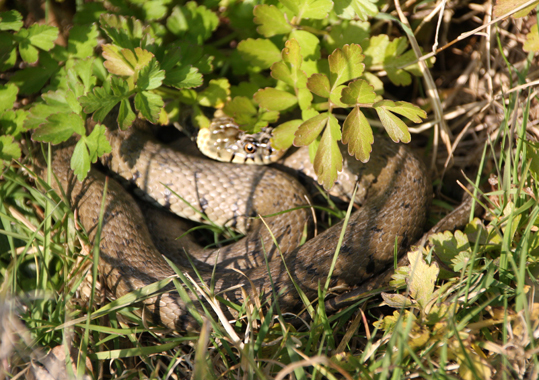 Apparently grass snakes have black bars down the side of the body whereas adders have zig-zag stripes. Although I don't suffer from ophidiophobia, or a phobia of snakes, I am wary of being bitten by a poisonous variety. Many years ago, my uncle was bitten on the bum while using a hole-in-ground toilet when camping in woods. He then had an embarrassing trip to hospital with his trousers still round his ankles. Shortly after seeing the snake, I wondered if it had been an omen warning me not to cross the stile.The meadow on the other side of the hedge was deceptively boggy and my boots sunk into deep mud. It got worse the further across the field I went, and I eventually turned back when faced with a stream that had burst its banks. In terms of spiritual messages, snakes often represent renewal and transformation - letting go of the old and letting in the new - because they shed their skins. I recently cast a springtime candle spell to help me declutter my life. Seeing a snake could perhaps be a sign that it is the right time to discard things that have outlived their purpose and make room for change.